This post is in collaboration with and sponsored by Clarins. When it comes to Clarins, my love runs deep. I've been a fan of the brand for years and this is something my OG readers definitely know about me. Going to a department store was my favorite because I loved finding Clarins' latest and greatest because somehow they knew the trend before it was a trend. Luckily, this summer there is a brand new collection to keep your complexion bronzed, your lips moisturized and your eyes looking riiight. I am a huge fan of every product, and one makes me super nostalgic too. Let's dive in. All photos were taken by Tavio. Summer is the time of tan. However I am not a big advocate of frying yourself out in the sun. There's nothing fun about skin cancer, sun spots or a sunburn. I prefer to add that tan through fake tanning products, and bronzer. This new bronzing compact is so lightweight and pigmented. 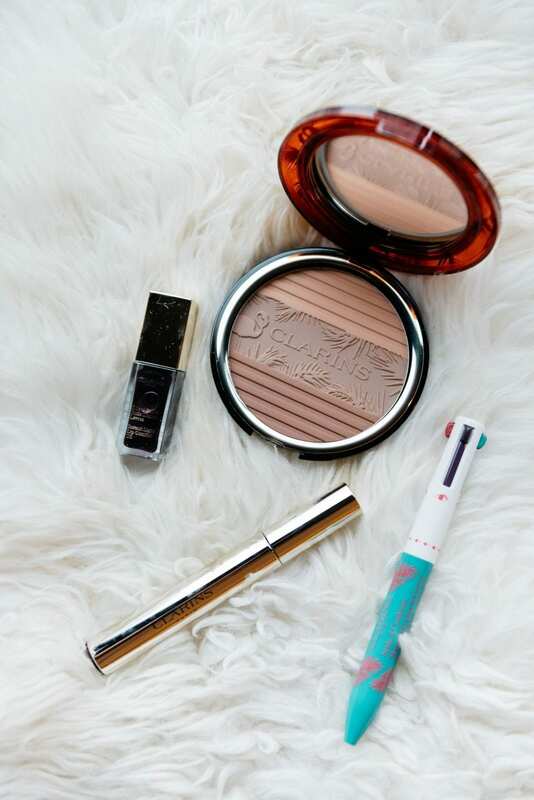 Not to mention the flamingo and tropical design is the cutest thing you're going to put into your makeup bag. There's a few different shades in the compact which makes this the perfect go-to for so many different skin tones. Anything that makes me nostalgic or reminds me of my childhood, is my favorite. Especially when it comes to beauty. I love seeing trends come back. The 4-in-1 pen is so reminiscent of my childhood I cannot begin to even tell you! The retractable element of the pen is so much fun. There's 3 shades for eyes, varying from black, emerald and even plum. The 4th shade is for the lips but it can be used to line and contour the eyes. Since it looks like a pen, you can easily just pop this into your purse and go about your day. It's easy to use on the go, making it more valuable over time since you'll reach for it more. Lashes are a huge part of the eyes, and my favorite piece to elongate. Voluminous mascara has always been my favorite because I want to ensure there's volume on volume. It attracts people to the eyes, and just makes the entire look more complete. Something about lashes makes you look more awake, and ready to take on the day. This volume mascara is making a difference when it comes down to it, and I typically do not find new mascaras easily. It's also not too cakey or rough with lash extensions which I appreciate. When it comes to keeping the lips moisturized, the comfort lip oil is the best source of hydration for the lips. The unique element about this lip oil is that there's 3 ways to use it. It can be applied before lipstick to give you a more even and smooth application. It can be worn alone throughout the day, or just inside to moisture the lips. Or finally, you can add it on top of any lip color to add shine. One recommendation I have is to wear it alone. Be cautious of how much lip oil you use if you're rocking it with a lipstick. Because of how moisturizing it is (and it is an oil after all) it has a tendency to run outside the lip line when applied heavily, so I've found a perfect medium so my lips are moisturized but not so moisturized that the lipstick color does not stay within the lines of my lips. 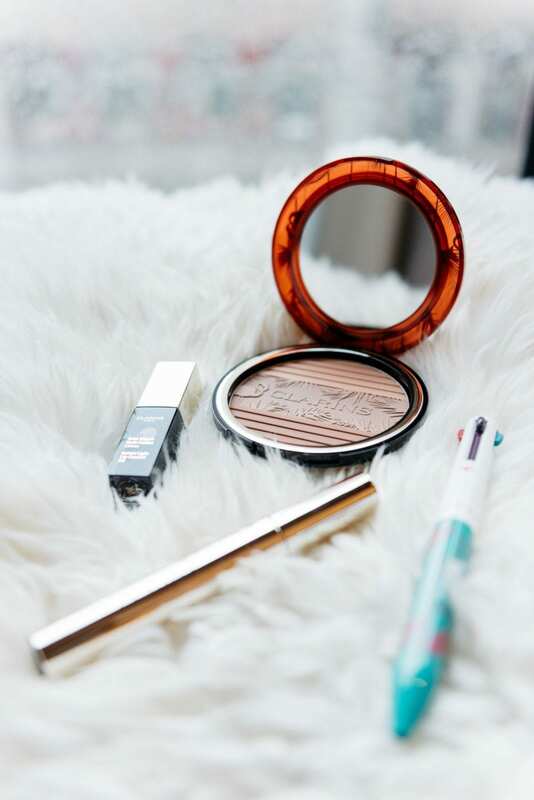 This new summer collection is gorgeous, with my favorite piece being the bronzing powder. Because there's a mixture of colors, from light to dark, it really gives us that versatility to use various shades. Since most of us see some sun in the summer, the darker shades can be used once you get a nice tan while the lighter color is perfect for the time being. During the hotter months, I like to ensure my lips are hydrated so the comfort oil is perfect. Not to mention I like to avoid heavy eye makeup so I say no to the eyeshadow but some light liner is perfect. Voluminous lashes are always in, so add a coat of that and I'm ready to head out the door. What's your favorite summer product?